“Following the plenary session, more than 5,000 Policy Conference delegates took to Capitol Hill for some 500 Congressional lobbying appointments”. This sentence is taken from the AIPAC (The American Israel Public Affairs Committee America’s pro – Israel lobby) website. The news article was on the 2008 Policy Conference hosted by AIPAC the previous week. How important this conference was for the US frontrunners for the White House. Hillary Clinton, Barak Obama and John Mc Cain gave speeches about Israeli – US ties. "We know that we cannot relent, we cannot yield, and as President I will never compromise when it comes to Israel's security (…)" Senator Obama said. He even exceeded what most current Israeli leaders would say by declaring: "Jerusalem will remain the capital of Israel and it must remain undivided (…)”. From the three speeches mentioned above, the strongest one and somehow the most revolting one comes from Obama, the candidate of “Change” and the author of the “Yes We Can” slogan. It is the same Obama whose comments drew fire in the United States particularly from AIPAC supporters when he declared months ago that “Nobody is suffering more than the Palestinian people”. In a campaign for Presidency, and particularly in the United States, such comments can be fatal. There, the “Israeli friendly” ingredient is an indispensable recipe of any successful campaign. The smart Obama appears to be playing it by the rules when it comes to foreign policy. He corrected his earlier statement during a presidential debate when he clarified that his remark about the suffering of Palestinians “was actually an indictment of the Palestinian leadership” that he believes “has caused much of the Palestinian suffering”. Obama, the “offshore President” as dubbed by the New York Times might be a revolutionary choice for Americans. He is the first Afro-American candidate to ever have a real chance of becoming President. His social and economical slogans might bring him to power at a time when Bush’s administration appears incapable to deal with the foreign policy and economical problems it generated since 2003. But on the Israeli – Palestinian level, Obama is a déjà vu, same as any American candidate who wants to be elected. This is a no-go zone, and AIPAC is just too powerful. 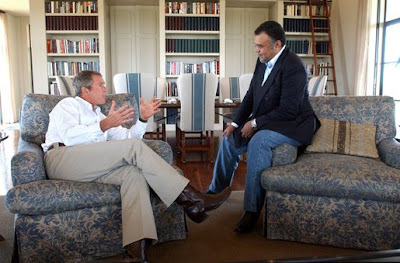 On such occasions, I remember this image of Prince Bandar Bin Sultan (ex Saudi ambassador in the US), relaxing with George W Bush in his Texan ranch. I sometimes naively ask myself why our powerful Arab officials and Diaspora, and many of them very well connected to the centers of foreign policy making, did not come up yet with a kind of Arab response to AIPAC. But suddenly, the BAE “Al Yamamah” story brings me crashing back to earth. And this is just only one example of why we are not capable of organizing ourselves the AIPAC way. * There have been numerous allegations that the Al Yamamah contracts were a result of bribes to members of the Saudi royal family and government officials. According to these allegations BAE Systems paid hundreds of millions of British pounds to the ex-Saudi ambassador to the US, Prince Bandar Bin Sultan.